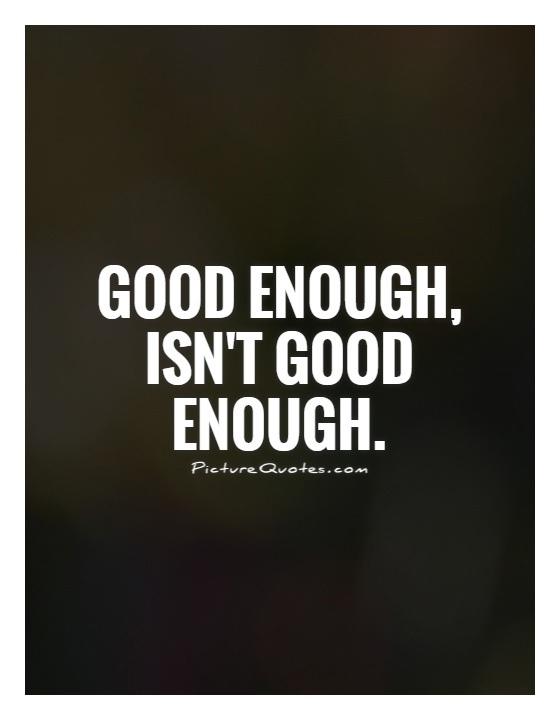 Battling the concept of "good enough"
I remember thinking how simply and clearly it was stated. I remember the pride in the manager's face when he saw that I noticed it, too. How often do we all say "good enough"? How often do we settle for less--either as consumers or as producers? At N Zone, we have a maxim that says "Products as Promised". The slogan has evolved over the years but the basic tenet is that your products are what you want or we're going to make it right. We don't haggle. We don't argue. We try to find a reasonable solution. Sometimes it can be pretty painful to replace or discount products--but we do it anyway. Fifteen years later I'm glad that we have our slogan. 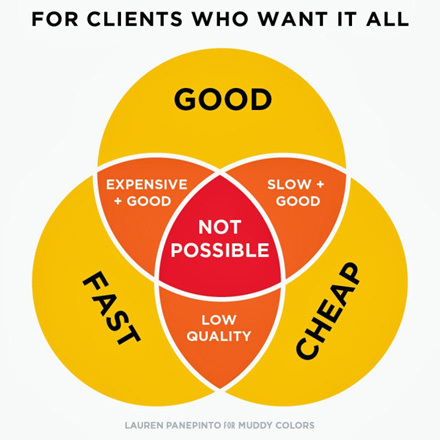 I'm glad we still stand by our products when companies around us are promoting "super quick--dirt cheap" but I do wonder if the consumers are being trained to accept 'good enough' while N Zone strives for a higher standard than just'good enough'. Are consumers being conditioned to expect mediocrity? If the pizza shows up cold do we call the store or do we justify the poor performance of the store/delivery because it was (hopefully) cheap? Are we all guilty of accepting someone else's "good enough"? More importantly, what would happen if we all said "I demand better"? We love our customers. Our customers love us. Still...it's sometimes amazing how often both consumers and suppliers have to be reminded of the simple triangle above. Our standard turnaround at N Zone is 15 business days. Three calendar weeks. For existing customers we usually deliver in 10 business days if we already have art on file and other details hammered out ahead of time. To some this seems like an eternity. Sometimes it seems like it's not enough. It also seems like there's always a cheaper price nowadays, too. The good news is that it also seems like the consumers are (slowly) learning to not chase the absolute cheapest price (that's usually online) and instead seeing that even the consumer triangle applies to online sales as well. Out of curiosity if you could pick ONE thing you wish N Zone could improve upon--would it be to be faster, cheaper or higher quality? Email me! I'm truly interested in hearing what you think! 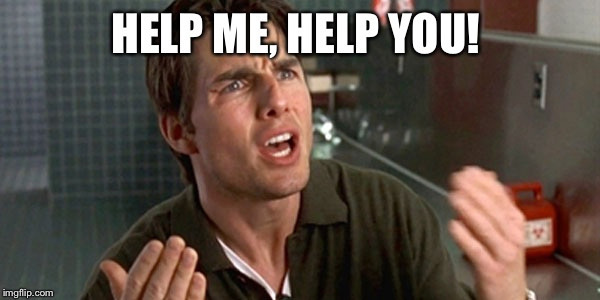 There's an old saying when dealing with any production company. The clean version is "garbage in,garbage out" but we've all likely heard the more (ahem) concise versions, too. The bottom line is that the better information the customer gives to the company at the beginning the better product will be the result. Whether you're buying paint or pizza,diamonds or dump trucks...the better information we get the greater chance we'll deliver things exactly as you wish. Is the information all there? Well, yes, technically it is...but for anyone who's ever used Excel the goal is to always be able to sort and clarify/consolidate the items. Having items helps with production quality but also aides in making sure we have the correct items to be able to confirm with customers. Notice on Jane's item above...is that a quantity of three X-Large shirts or quantity of one 3 XL shirt? Kind of a big difference. Happens all the time...and imagine how many times we'll need to clarify with you (taking your time) or how often we'll guess incorrectly (taking time and money). It'll make your life easier and probably make your order with N Zone be that much easier all the way through and then we'll be "perfect in, perfect out", right? To celebrate National Embroidery Month today's blog post is about what we consider to be the most important part of the process--the digitizing. You'll often hear sales people say "we will have to digitize your logo" as part of a presentation of clothing and logo work. At its heart an embroidery machine is just a giant plotting machine that makes calculated moves on an X and Y axis. The machine doesn't care whether it's a hat, a bag, a jacket or a sport shirt that's locked (hooped)into place to be sewn. 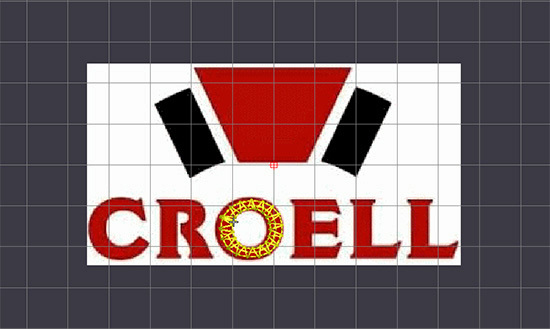 There are variations on how the logo might be digitized based on the different fabrics but that's another topic for another day. In layman's language the machine is told "move up and to the left one millimeter, push needle down, lift needle up, move down and to the right,repeat" until all the stitches are put into the garment. This happens up to 1000 times per minute so it's really a blur to watch. 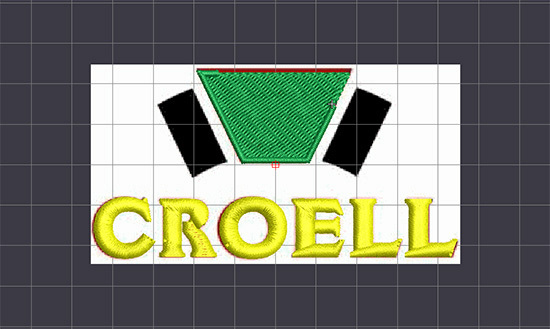 The first step is we scan our customers' logo into our software. This is our first opportunity to clean up and repair the artwork that's provided to us in one of the many formats our clients use. The second step is creating an stable base for each segment of the logo. 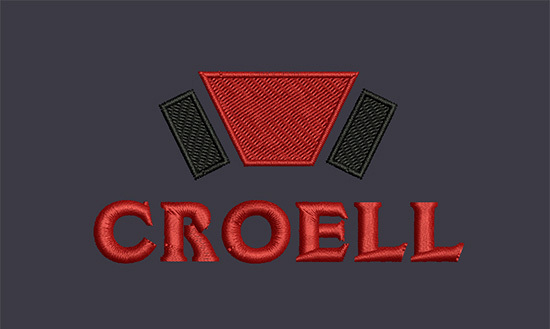 A good embroidery artist will study the garments being used and also has good understanding of how the embroidery machines work and think so that the finished product is as perfect as possible. In the image below(the yellow stitching is for illustration purposes only) you can see three concentric circles of yellow stitches covered by zig-zag stitches in the letter"O". This pattern is designed to both stabilize the garment but also create a better environment for the future stitches to rest upon. Without these base stitches the letter might sink into the fabric or change shape slightly--both of which aren't the quality we want to produce. 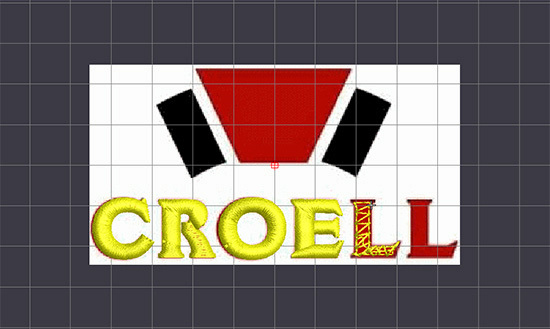 Below you can see the first 4 letters have been finished. Just as above the "C", "R" and "E" have had base stitches underneath but now you can see the finished, rich satin stitches of each letter. With the text finished the designer then moves to the other elements of this logo. Again, for quality purposes we add base stitches to hold the garment in place and then add the second layer of stitches that we actually see. Below you can see a screen cap of the sewing process. The top left corner of the red trapezoid shape is being filled with stitches at roughly 1000 individual stitches per square inch. These stitches are incredibly dense,durable and tightly woven. The pattern, direction and density can all be altered by our design team to change the way light hits the logo to alter the overall finished product. With the fill stitch completed in the middle section we add a detailed satin stitch around the border of the area. This cleans up the edges and gives a better finished look. Below is the completed design as digizitzed. As stated above, the colors shown are primarily used internally for our own illustration to indicate that each different area is a separate sewing sequence when programmed into the machine. 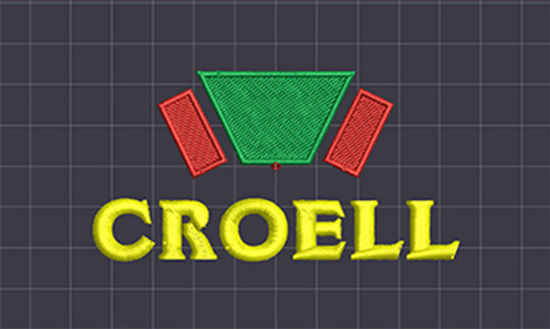 In this logo, the yellow "CROELL" text is the first sequence, the green trapezoid is the second sequence and the two red rectangles are the third sequence to be sewn. The machine operator who uses this design file will have to program the machine based on the actual requests of the customer. Based on garment and customer input we then program the machine. We could sew all three sequences in the same thread color or all three could be different colors. In this example, sequences 1 & 2 (text and trapezoid) are to be sewn in red and the 3rd sequence (rectangles) is to be black. Almost there--we send the image above to the client for approval. During this process we also will sew several test runs on different fabrics to make sure everything meets our standards. Our artists are familiar with the machines and usually produce the text runs themselves so that they personally see each logo to ensure that the logo they create will sew smoothly and perfectly. It's not uncommon to add or subtract individual stitches in a logo to finalize the production run. Every time weed it a logo we will sew a test sample to confirm our edits were correct before we allow the file to proceed to the actual customer's garments. Not all logos are the same and the process shown here might take as little as 90 minutes and might take all day with edits, samples and approvals. We take tremendous pride in our ability to embroider many types of fabrics with even the most complicated of graphics and hopefully this brief tour has shown some of the back room work we do to make things look great for our customers! Last week the sales team from N Zone attended our yearly trade show in Las Vegas, where we shopped and viewed all the "hot" items for 2019 that are available in our industry. We also took the time to spend a day in education sessions to hopefully expand our minds a little and learn a few new things along the way. 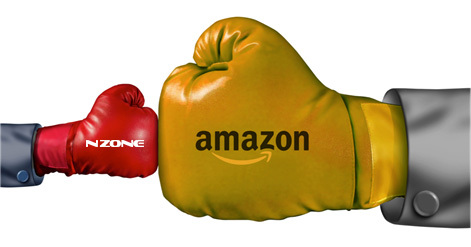 A common theme this year (and it's almost comical that it was somehow presented as anything new) was how to sell and compete against the likes of Amazon and other online behemoths. I was reminded of a time in the late 80's and early 90's when the battle cry around many communities was "we have to stop Walmart!!" and the public outcry of what Walmart would do to the local businesses. There are so many similarities between the rise of Walmart and the rise of the Internet but the common thread to how we, as local/small businesses can compete against them hasn't changed: service. The initial panic felt by retailers when Walmart moved to town eventually gave way to the realization that while Walmart might have cheaper products,they also aren't very good at helping you find the product that you need, or worse yet, they know very little about the products themselves. So, smart retailers upped their game with service and knowledge and the consumers who demanded better remained loyal. Walmart replaced the bottom retailers but the top stores survived. The internet's strength compared to Walmart is that it has infinite levelsof research materials on the same device where you're shopping. There really is almost no excuse for failing to make an educated decision withan online purchase, right? Besides, after doing all the research prior to purchase you can also read reviews from other consumers and see what they think, right? Well...here's the problem. The internet lies. I know, Iknow...I'm shocked, too. Just for fun, go ahead and search "Amazon review fake percentages". You'll find countless articles stating anywhere from forty to sixty percent of online reviews as being fraudulent. This one from Forbes is a good start. Most studies agree that 80% of communication is non-verbal. So…if 50% of what’s online is untrue and 80%of what’s communicated via written words (and by extension, online) falls through the cracks is it any wonder that people who shop online are continually disappointed? The consumers are going to figure out that it’s still (and always was) better to shop face-to-face than online. It doesn’t mean Amazon is going away, of course, but it does mean there will be a shift back to traditional shopping as consumers try and try and try to “save money” and ultimately decide to buy from a brand, face and company they trust. WHAT IS THE N ZONE ADVANTAGE? 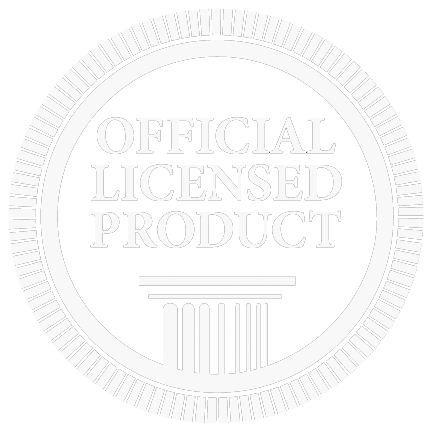 There are countless promotional products companies in the world. It’s a huge industry (twenty three billion dollars, give or take) and countless options both in person and online. To be quite frank–we think we’re the perfect company to handle the needs of a wide segment of clients who purchase our products. Being in the top 5% of companies in sales volume means we’re big enough to handle large, complex orders. If you need 20,000 t-shirts in a couple days we can do that with our team in our facility. Being a small, locally-owned company means we still pay attention to the small companies who still seek quality products at fair prices. As we’ve said for more than two decades–no account is too big, no account is too small. The companies above us in the food chain likely can’t offer some of the personal service we offer–and that’s okay. General Motors isn’t taking our calls and there are printers who cater specifically to those huge businesses. Good for them. The good news is that the 22,000-plus companies who are smaller than N Zone simply can’t offer the things we do, like in-house digitizing, warehouse fulfillment programs, in-house printing, embroidery and laser etching production types as well as in-house webstore development services. We own our equipment, we own our building and we can control nearly 99% of the production chain of every order we sell. That makes us pretty cool. So besides the fact that our size is “just right” to really do a great job of servicing our customers, the bigger and better answer to “Why N Zone?” is that we have over two decades’ worth of customers who choose us over and over. Thousands of customers who answer the phone when we call and want to see us year after year. Our customers are loyal to N Zone because we’ve proven that they can trust us. We’ve proven we know what we’re doing and we’ve proven we’re capable. And that makes us pretty cool, too. So why N Zone? Because we’re awesome! !